Matthew and Josh take the lead this week as Dean and Jessica lounge around post-honeymoon. The lads got this episode off the ground at the behest of listener Benjamin Prugh who had a great idea for a charity episode. All those details will be covered on the pod. 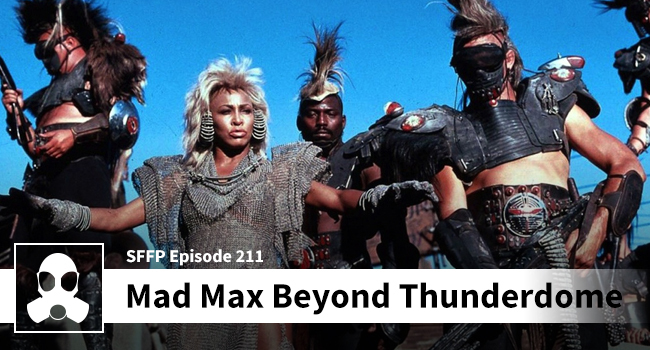 As for Mad Max Beyond Thunderdome there was plenty to like, and although Josh was salty because his cartoon Transformers lost the vote, he enjoyed this flick. Matthew was also high on ‘Beyond’ after a second watch. One of the most fascinating aspects of this week’s episode was that Matthew was forced to take notes for scene transitions because he didn’t have his binky Dean to lean on. Josh says that Matthew is “all grown up now” and LSG Media is hopeful for Matthew’s continued growth.